[prMac.com] San Francisco, California - Smile, the developer of productivity applications for Mac(R), iPhone(R) and iPad(R), has released PDFpen and PDFpenPro 10.1, an update to its all-purpose PDF editing tool for Mac. Version 10.1 offers an improved form filling experience, better link visibility, and control over image opacity, as well as scripting access to some of the features new to v10. Version 10.1 remembers Form Field & Link Highlighting settings on a per document basis, providing a more consistent experience across multiple sessions editing a document. Checkboxes are now included in Form Field Highlighting. Link destinations are visible on hover through descriptive tooltips. Image opacity joins other image editing features such as exposure, cropping, deskew, and more. Open documents automatically reflect the most recent saved version of a file open in multiple apps. AppleScripters have scripting access to three features new in version 10: batch OCR, headers & footers and page numbering. "We're thrilled PDFpen and PDFpenPro 10 were so well received, with their introduction of watermarks and batch OCR," said Philip Goward, Smile founder. "Now, with PDFpen and PDFpenPro 10.1, we've made several subtle yet powerful improvements to the form filling experience, the ease of using links, and scripting! Now our AppleScripting fans can customize their batch OCR processes as they've been asking for." PDFpen and PDFpenPro 10 work with PDFpen for iPad & iPhone version 3, allowing seamless editing across devices when used with Dropbox or iCloud. PDFpen retails for US $74.95, PDFpenPro for $124.95. Family Pack licenses, which cover up to five computers in one household, are $94.95 for PDFpen and $149.95 for PDFpenPro. Office Pack licenses start at $224.95 for PDFpen (5 users) and $349.95 for PDFpenPro (5 users). Upgrades from earlier single user versions of either application are US $30, and free to users who purchased on or after January 1, 2018. Upgrades from any previous version of PDFpen to PDFpenPro 10 are $50. Upgrade pricing for Family Packs and Office Packs is found in our web store. PDFpen and PDFpenPro 10 require macOS 10.12 (Sierra) and work great on macOS 10.13 (High Sierra). For macOS 10.11 (El Capitan) and earlier, see our website for compatible PDFpen versions. Demo versions are available. Full versions of PDFpen and PDFpenPro are also available for purchase on Apple's Mac App Store. * Upgrade pricing for Family Packs and Office Packs available. 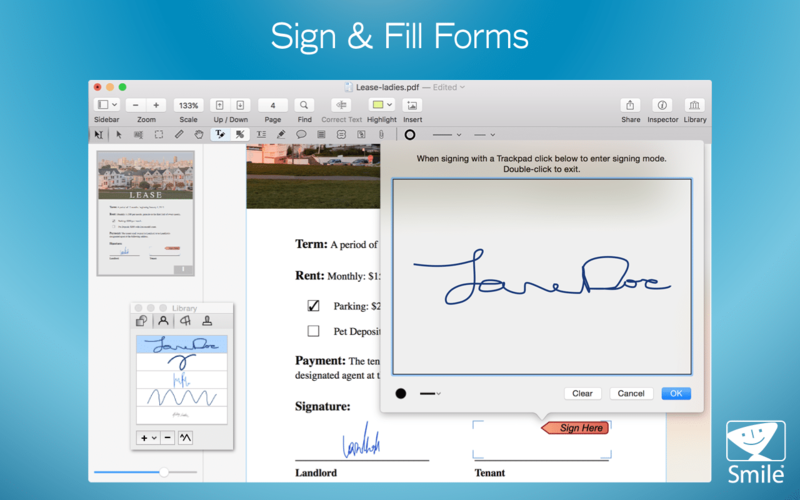 Single user upgrade from the previous version of PDFpen to PDFpenPro 10: $50 (USD). Site licenses: PDFpen $1249.95, PDFpenPro $1624.95 (USD). Site license terms: Single contact for support; single physical address or company with fewer than 1,000 employees. Smile makes clever software for efficient people, including TextExpander, the typing shortcut tool for Mac, Windows, iPhone and iPad; PDFpen, the all-purpose Mac PDF editor; PDFpen for iPad &amp;amp; iPhone, the mobile PDF editor; and PDFpen Scan , which brings the power of scanning and OCR to your iPad and iPhone. Copyright (C) 2018 SmileOnMyMac, LLC dba Smile. All Rights Reserved. PDFpen, PDFpenPro, TextExpander, and the Smile logo are registered trademarks of SmileOnMyMac, LLC dba Smile. Apple, the Apple logo, Mac, iPad, iPhone, and iPod touch are trademarks of Apple Inc., registered in the U.S. and other countries. App Store is a service mark of Apple Inc.